Super fun slime that is incredibly satisfying to play with – Pinch it, twist it, smash it, pull it over and over slowly or create arts with it. Just use your imagination freely with egg fluffy slime. 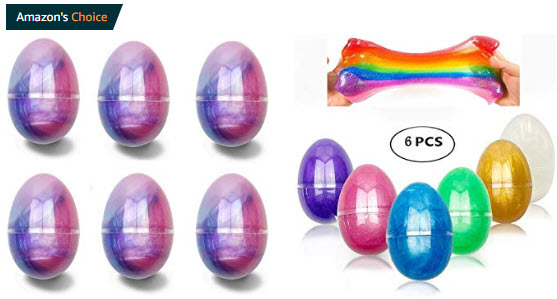 Egg Slime Come With Fruit Slices and Colorful Pearl Clear crystal slime and good colors. It’s soft, smooth, stretch long, it will not stick to the hands, walls or carpet but don’t stick to hair. After playing, put the dough back into egg box, can maintain choi mud softness. Made with environmentally friendly raw materials, 100% safe and non-toxic. Be assured to play, but don’t eat. Do not recommend too small children to play slime, suitable for children over the age of 6. Playing slime can exercise the kids’ coordination ability with hands, eyes and brain and develop the kids’ creativity and imagination. Our service will not end with purchasing, if you have any problem with our slime, please do not hesitate to contact us, we will do our best to fix the situation as soon as possible.